What is “a successful career” in science? Interestingly, most young and also more mature researchers can not define easily what “a successful career in science” means. This question is highly relevant – for example when looking for a new position, hiring people, defining long-term visions for an institution, developing funding schemes and selecting candidates to be funded. I have listed here – in random order – a number of indicators which may help to characterize a person, a group or an institution as “successful in science” – however, every single factor is a matter of debate and only a few are easily measurable – open list. How do we measure and evaluate performance and success? Which of these parameters are important for my OWN career? Which of these parameters are important for my institution/company? Which persons do I consider to be successful in science? Who should lead a specific science institution? Which elements are important for society? How should we train scientists? Therefore, it is useful to discuss these parameters with your peers and to become aware of the unspoken rules and beliefs within yourself and within your institution/company. WHAT DOES “A SUCCESFUL CAREER IN SCIENCE” MEAN TO ME? I find it useful to do this exercise once a year to see how my perspective changes over the years. Enjoy! 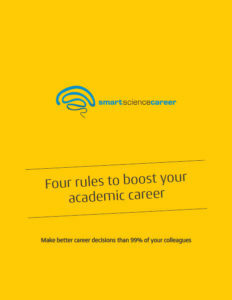 Please leave a comment below what a succesful career in science means to you! Did I forget any important aspects?